Some animals hibernate. Others fly south for the winter. Humans? We tend to vacation or curl up by the fire with a warm drink. But where do bugs go in the winter? We all love the sweet respite from bugs that winter gives us. The mosquitoes stop buzzing and we no longer need to worry about getting stung or bothered by bees and wasps. But you might still be wondering, where are they? Ants don’t go very far. They’re great at overwintering outside, even in our own backyards. They put on some fat during the fall in order to survive for weeks without any food (yes, just like bears). They then tunnel underground to avoid cold temperatures and hope their colony survives until spring, when their work begins all over again. The main priority of bees is to protect the queen, and that doesn’t change once temperatures drop. Bees form a winter cluster in the center of their hive, where they huddle together and keep each other warm. You won’t see any bees once winter hits. If you’ve ever tried to kill a cockroach yourself, you know they can withstand pretty much anything. So what’s a little cold? Most species can survive all year long as long as they have a warm, moist home (probably within your home). However, the cold slows down reproduction rates, so while you’ll still see them around your home, you might not see as many as you would in the summer. If you suspect a roach infestation, especially in the winter, it’s important to call in the pros to find where they’re overwintering. Although it feels like they suddenly disappear once it gets cold outside, mosquitoes don’t travel south for the winter or fall dead as soon as it gets cold. They overwinter in places like hollow logs to stay warm and survive until the spring. Females are the first to leave hibernation as soon as it warms up in order to begin developing eggs. Enjoy these few months without them! 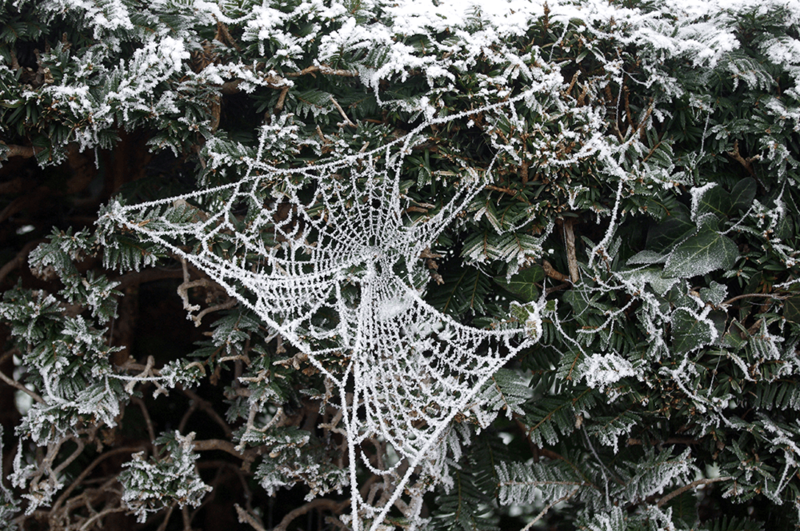 You may still see some spiders in the winter, but they definitely slow down and tend to overwinter once it gets cold. Many species overwinter inside homes, in crawl spaces, attics, and other dark, warm spaces. They may be in your home without you even knowing since their activity is reduced in the cold months. Keep an eye out for webs to give you a clue as to where they’re hiding. In warm climates and inside our homes, termites can survive all winter long. However, if they’re not living inside your home, it depends on the type of termite. Subterranean termites dig deep into your soil below the frost line in order to stay warm in the colder months. Others find shelter in dry wood around your home. If you have a termite problem in the warmer months, don’t expect the winter to kill them off for you; only a quality termite treatment will do the trick. Some tick species such as the American dog tick and the lone star tick are not active once it gets cold. Others such as the black-legged tick will remain active as long as temperatures stay above freezing. Many of their preferred hosts are hibernating during the winter, so we often don’t notice them until the spring when they have many more options available. Even though we don’t notice as many bugs in the winter, pests are always a problem unless treated. Don’t wait until it gets warmer again – if you notice any signs of pests in or around your home, call us. 706-979-2536.